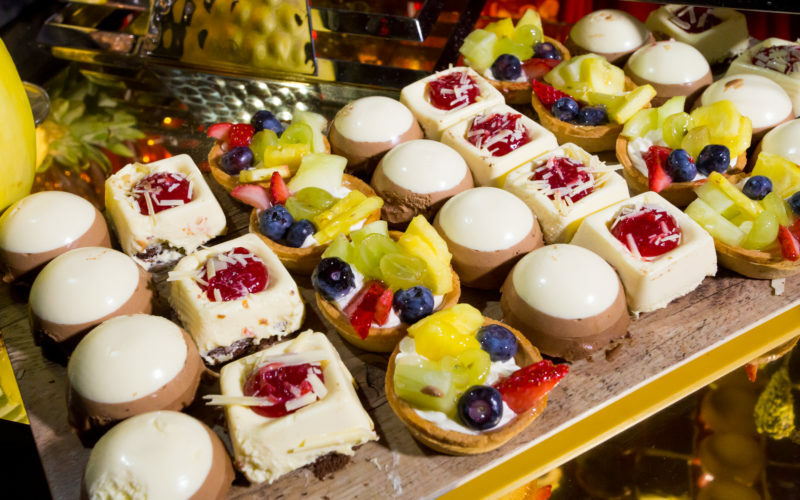 Desserts are everyone’s favourite at any event and some would say the most important part of any meal. By desserts we refer to usually anything sweet from cakes, pastries, ice creams as well as traditional Indian desserts consisting of variations of flavours, textures and appearances. Fruit is also commonly considered as part of a dessert course because of its naturally occurring sweetness. When it comes to the more traditional Indian sweets, a majority of mithai is made from sugar and milk, however this can vary by region. Most Indian sweets are flavoured with almonds and pistachios whilst they are spiced with unusual flavours such as cardamom, nutmeg, cloves and black pepper. They are finally decorated with nuts or with gold or silver leaf, which gives the mithai a unique look. Some of the more common Indian desserts include, Gulab Jamun, Gajar Halwa, Ras Malai, Phool Kaja and various flavours of Kulfi. If you fancy trying something different to the usual traditional Indian sweets, we also have a selection of mouth-watering European desserts. From a selection of Macaroons to Cheesecakes and Petit Fours as well as Middle Eastern specialities Baklawa a rich, sweet pastry filled with nuts and sweetened syrup. 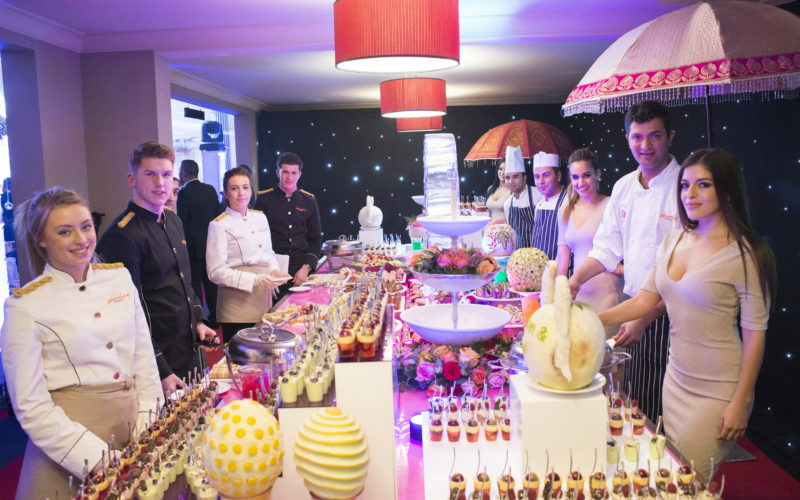 Here at Sanjay Foods we are renowned for our attention to detail and amazing presentation incorporating our wonderful hand-carved fruit displays into your dessert bar. We understand that the dessert is usually the focal point of any wedding and we will ensure you leave a lasting impression with your guests. Soft milk cake dumplings in a sugar syrup (can be served with ice cream). White milk cake balls in a sugar syrup, served cold. Home-made ice cream made with fresh mango. Home-made ice-cream flavoured with pistachio. Home-made ice cream delicately flavoured with saffron. Home-made plain ice- cream with a rich and creamy texture. Warmed chocolate brownie with a rich dark chocolate ganache and Chantilly crème. Raspberry and sherry trifle drizzled with a strawberry coulis. Banoffee cheesecake with home-made toffee sauce. Fresh Strawberry or Lemon flavour. Cheesecake: Chocolate and Orange, Mango, Raspberry. Bread and butter pudding sprinkled with nutmeg. Sticky toffee pudding drizzled with toffee sauce and served with vanilla ice cream. Eton Mess with fresh seasonal berries crushed meringue and whipped cream with a raspberry coulis. Autumn fruit crumble with special honeyed yoghurt. Fresh Mixed Berries with Chantilly Crème. Lemongrass Panna Cotta topped with macerated fruits in Malibu syrup. Shot of lemon posset with shaved lemon zest and Shortbread coin.